A pair of Menomonie sisters opened a new breed of youth fitness and play facility in October. Jesse’s Jym, E4699 430th Ave., is an adaptive sensory gym where kids of all abilities can romp around and develop their muscles and minds. 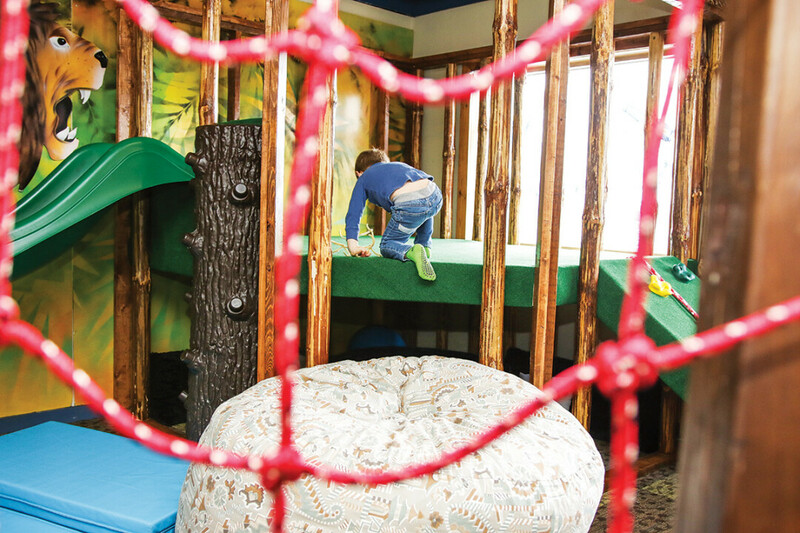 Every toy and piece of play equipment in Jesse’s Jym is meant to be touched, the staff is trained to work with children who have sensory processing disorders, and parents never need to apologize for their kids’ outbursts, enthusiasm, or struggles. The gym’s floor is covered in mats, and spinning swings hang from the ceiling. In the corner is a small jungle gym – with a jungle theme – that sports a slide and a miniature rock-climbing wall set at a gentle angle. A mural of a toucan watches as youngsters climb a net; and if it all gets a little overwhelming, there’s a dimly lit room where kids can calm down with soothing music, essential oil diffusers, and visual stimulators such as a glitter lamp. The main room opens into a big, open room that will eventually become a place where kids can really zoom around. It will feature a trampoline and toys for more athletic activities, and give older children room to move around freely. “When you go anywhere and you bring an autistic child, people point, and they laugh, and they do the little whisper thing. They don’t understand.” That’s Darcie Larrieu’s take on navigating the world alongside a young person with a sensory processing disorder. She’s the aunt of 14-year-old Jesse Walker, who was diagnosed with autism when he was 4 years old. Jesse’s mother, Tanya Stoekler, is the quieter of the pair – Larrieu describes her as the “technical” one. Stoekler a board-certified behavioral analyst and therapist. While more resources were available to Jesse after his diagnoses, they did not provide the scope of opportunity Stoekler believed he needed to succeed. While a parent or therapist can teach a child to, for example, share a toy with them at home or in a session, there is little opportunity under those circumstances for them to learn how to generalize the behavior and apply it in more situations, Stoekler said. And with few kids’ gyms – and the children and parents who frequent them – being equipped to support special needs children in their exploration, there is no place to practice the skills developed in the home and with the help of professionals. “That’s really where we’re failing these children,” she said. Jesse’s Jym is not the first sensory gym in the United States, but Larrieu and Stoekler guess that it’s the first to offer the kind of developmental programming they’re planning on providing. Stoekler has developed a number of classes and workshops where children can learn with each other. This includes sensory exploration for younger kids, yoga for all ages, and social skills and self-acceptance therapy groups for adolescents. Once the sisters decided to commit themselves to opening the gym, it was smooth sailing. Except for finding the right space. And the right landlord. And the right insurer. The venue had to be spacious and in a low-traffic location. Rentals with shared walls fell through when landlords were concerned about the potential noise. And insurers were hesitant to take on the perceived risks associated with an establishment that deals primarily with special needs children. Now that it’s all fallen into place, Stoekler and Larrieu are proud of the service they offer kids and their parents. “Parents of special needs children don’t get to go get their hair done, or go to Caribou Coffee, or just go down the road,” Larrieu said. When they do go out with their children, they face social pressures from others who make assumptions or pass judgment. They spend much of their time apologizing for themselves and their children. 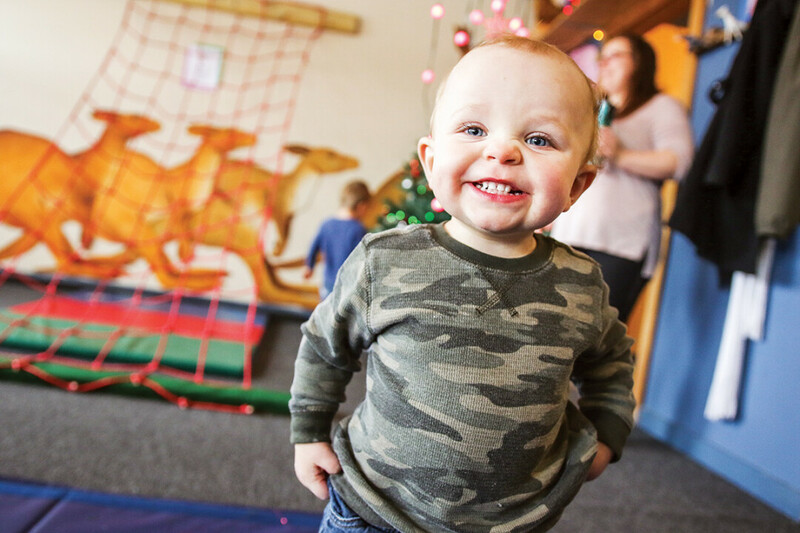 In addition to providing children with a place to grow and explore, Jesse’s Jym is a place where parents don’t have to worry. They even offer “Fun Respite,” a program where parents can schedule in advance to drop off a child for an hour or two to play while their guardian runs errands, attends appointments, or just takes a moment for themselves. “You shouldn’t have to say you’re sorry every time you have to go somewhere,” Larrieu said.